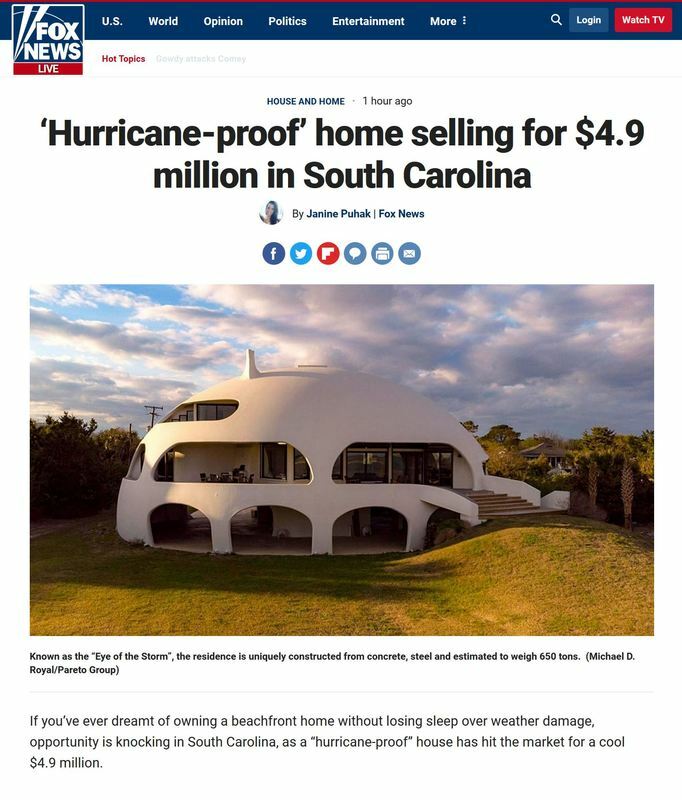 If you are interested in purchasing the Eye of the Storm, please connect with your preferred Charleston area real estate agent or Michael Royal (843-202-0604, michael@pareto.gr), who is the grandson of the former owner and the listing broker through Pareto Real Estate. The Daily Beast’s take on the Eye of the Storm is here. 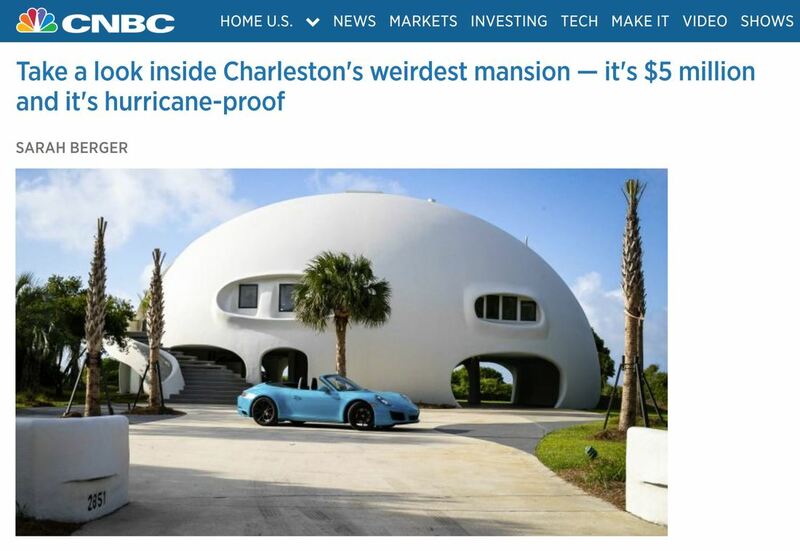 "While hurricane protection was the raison d’être for this unique home, it’s not the only thing that matters. Eye of the Storm was designed to maximize the view and create something of a theater from which to watch Mother Nature’s antics." Dwell.com likes the Eye of the Storm. See the article here. "The home's unique architecture was a collaboration between architect X Dilling and builder George Paul, and its distinctive shape makes it stand out in its Sullivan Beach neighborhood." "The pinnacle of summer luxury is owning a house on the beach, where you can spend your days collecting seashells and your nights listening to the steady roar of the ocean waves. This kind of indulgence can also be something of a precarious proposition. . . . But one innovative architect had an idea for how to enjoy the coast with a little more peace of mind. 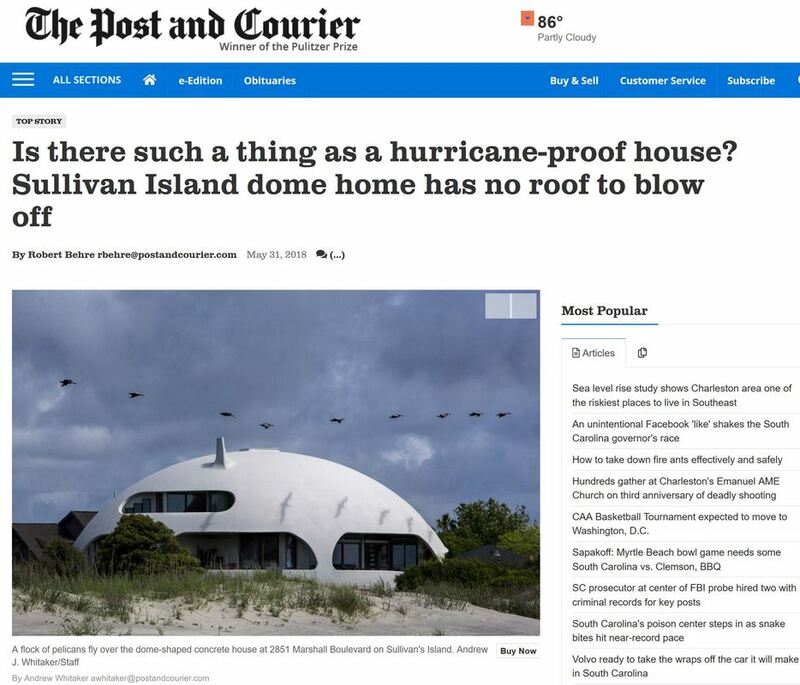 Meet the Eye of the Storm, a domed home on the Atlantic Ocean-side of Sullivan’s Island just off the coast of Charleston, South Carolina, where summer leisure and storm safety go hand in hand." 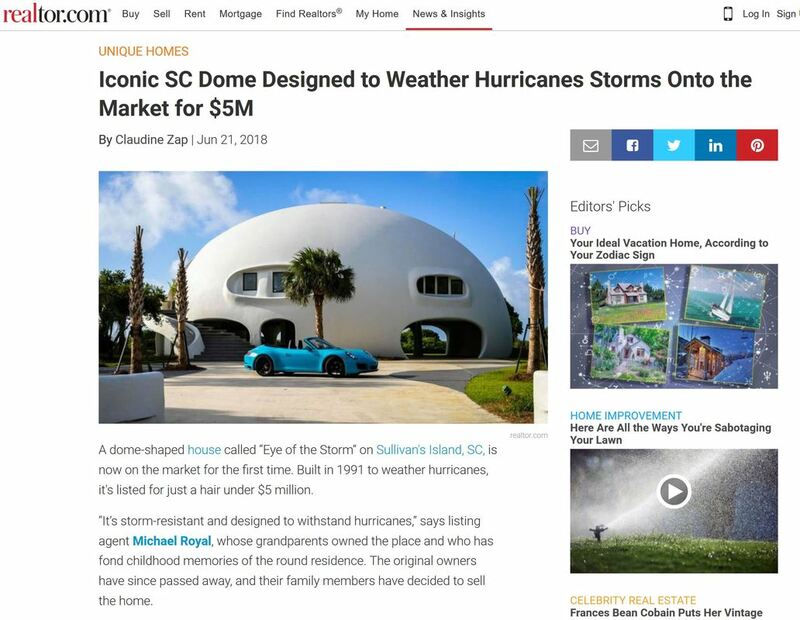 "Just because a home doubles as something of a hurricane bunker, doesn’t mean it can’t also be spacious and comfortable." 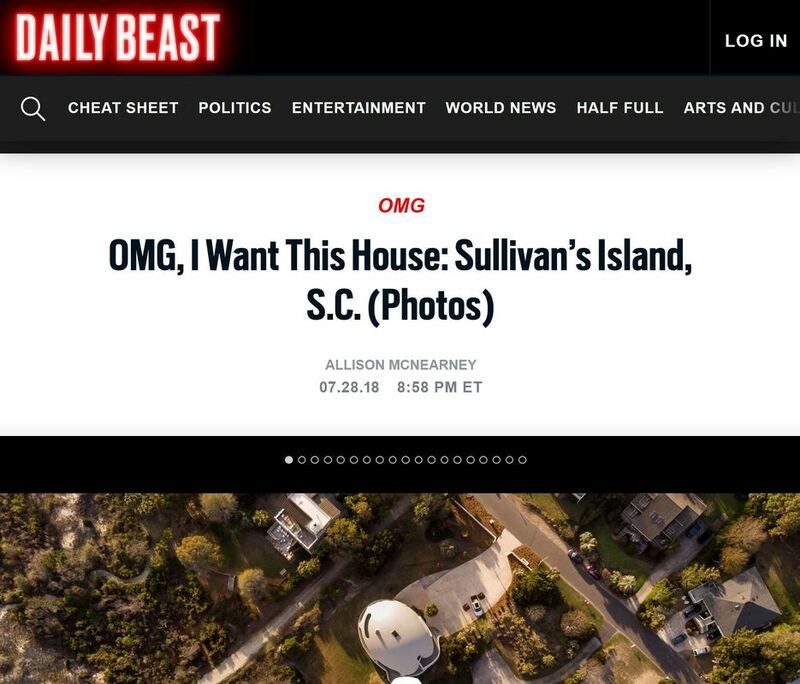 "Not only will you have one of the coolest houses in the neighborhood, you’re also in one of the most prime locations on Sullivan’s Island — right at the tip of the maritime forest and only a short 230 feet walk to the beach." Business Insider discusses the Eye of the Storm’s design and construction method. Read the article here. CNBC.com featured an article about the Eye of the Storm today. Not sure why the author called it a “mansion,” but otherwise, a great write up. 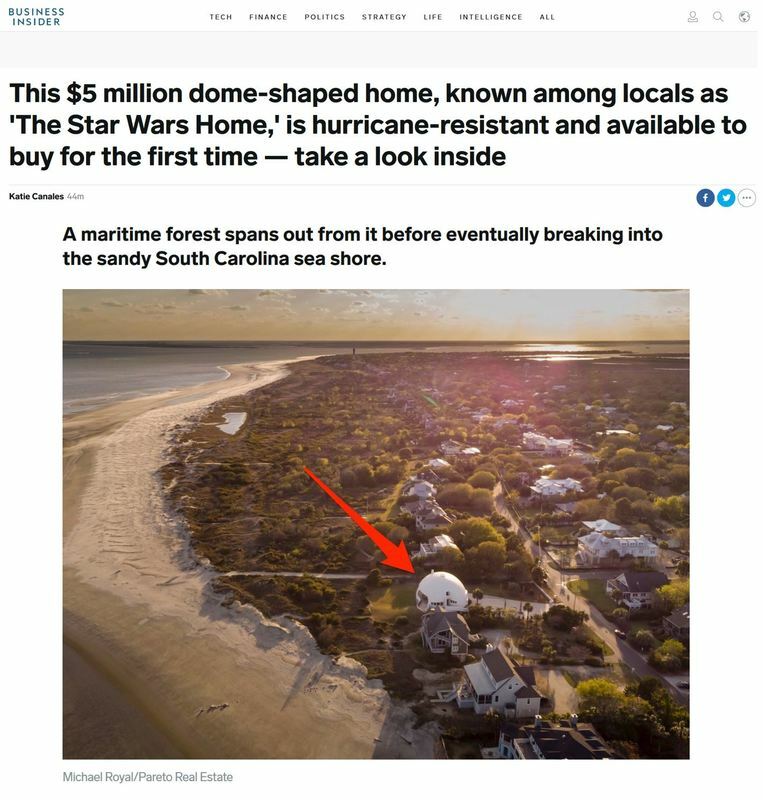 Realtor.com published an article by Caudine Zap today about the Eye of the Storm, and it was listed as one of the most-read articles on the site. The Eye of the Storm has found its way to the front page of FoxNews.com – see the article here. World renowned architectural photographer Mike Kelley and Fstoppers owner Lee Morris battle it out to see who can take the best picture of the Eye of the Storm in the latest installment of Fstoppers, viewed by 300,000 on YouTube. 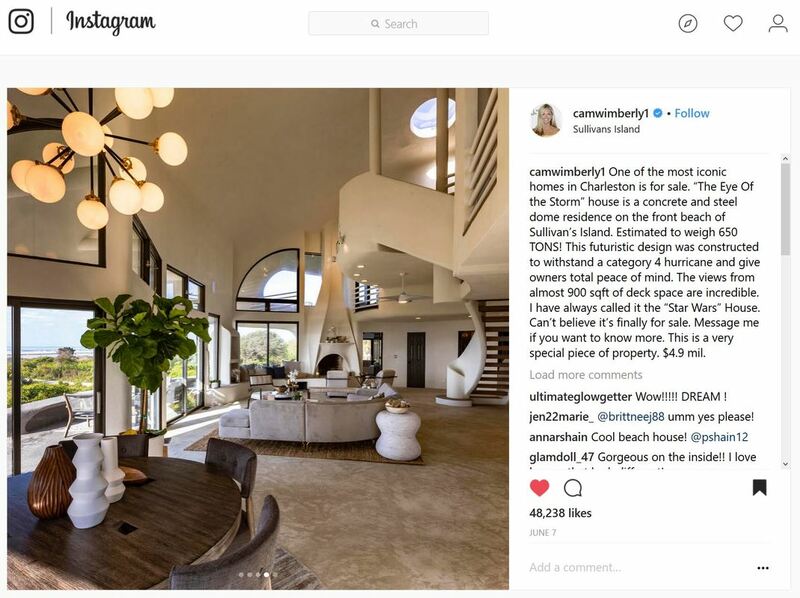 Cameran Eubanks of “Southern Charm” fame posted about the Eye of the Storm on her Instagram account and generated over 48,000 “likes.” She is a real estate agent and can be contacted here to represent a buyer in the purchase of this home. Check out the Charleston Post & Courier article by Robert Behre about this iconic home, and the P&C's photo gallery. From the article: "When Huiet and Helen Paul lost their beachfront home to Hurricane Hugo in 1989 — just as they were finishing up a $175,000 renovation — they didn't just rebuild. They rethought. 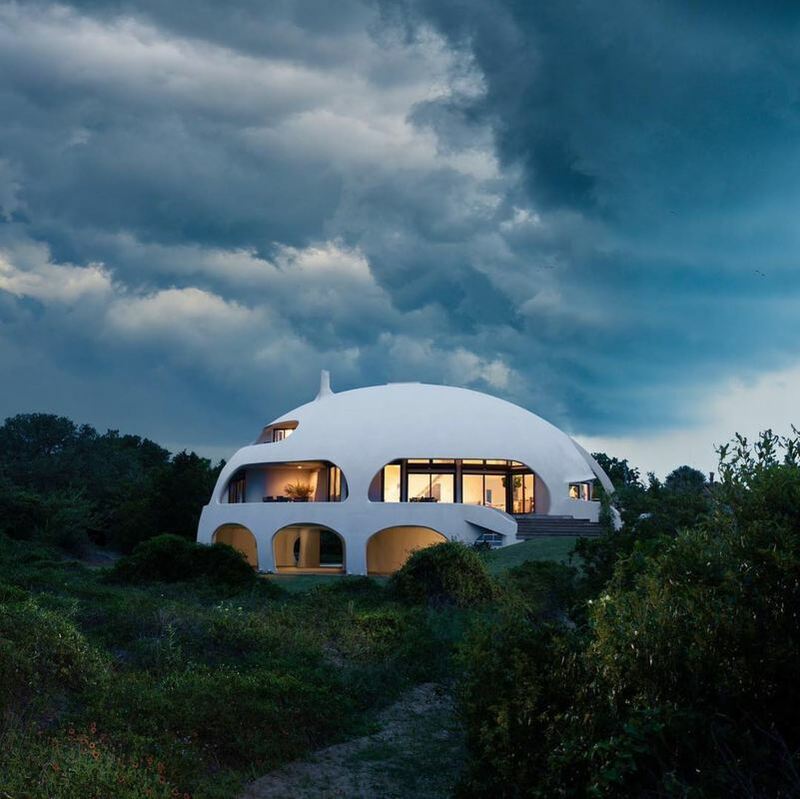 And the resulting product was a unique coastal home, a concrete dome that appears to bubble out of a sand dune." "The home's design arose from aesthetic considerations as well as structural ones." In 2003, South Carolina Homes and Gardens featured the Eye of the Storm in a cover story. Download a PDF copy below. ABC's Good Morning America ran a spot on the Eye of the Storm during its construction in 1991 the builder and the owner. 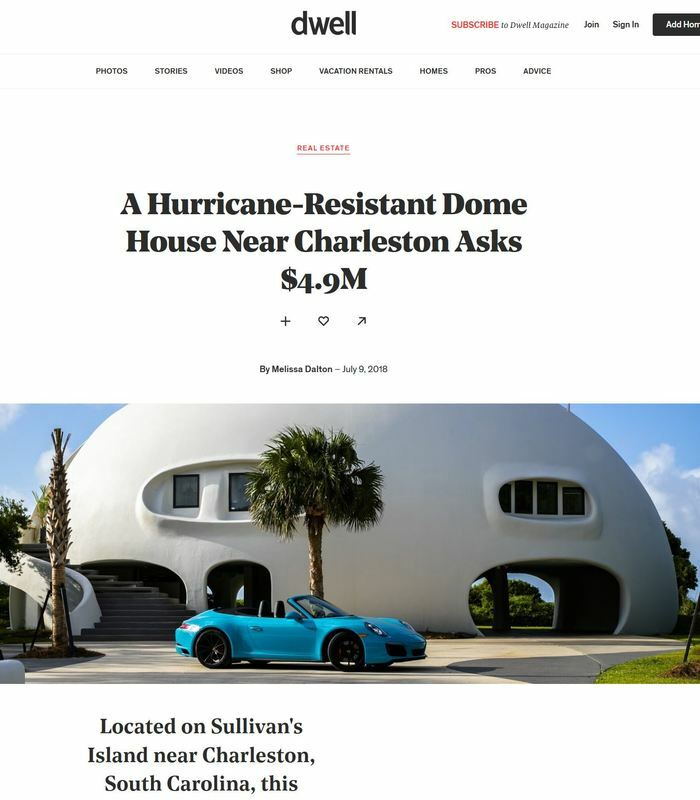 Since its construction in 1991, the Eye of the Storm, a concrete and steel dome residence on the front beach of Sullivan’s Island, has become a well-known Charleston area landmark. Weighing in at an estimated 650 tons, the home was designed and built with the aim of withstanding the kind of storm that destroyed its predecessor in 1989 when Hurricane Hugo laid waste to islands across the Lowcountry. After losing their original home, the owners of this property hired their son, who had built dozens of concrete domes by that time for both industrial and residential users, to create for them a home in which they would have peace of mind for the rest of their lives. Now, 27 years later, after an interior renovation, the Eye of the Storm is being marketed for sale for the first time. The home is approximately 3,571 SF of conditioned space on the main floors with three bedrooms and four full bathrooms, plus 526 SF of ground floor (uninsurable) conditioned space for a total of 4,047 SF of conditioned space. The ground floor also features an enclosed storage room, a bathroom, and two shower rooms. While the shell of this monolithic (no separate roof) thermospheric (energy efficient) structure repels bad weather, it also creates a theater for nature’s beauty. The glass on the beach side, inset from the dome shell, maximizes views on the 100 foot wide, 0.48 acre lot to the beach, 230 feet away, where the home is perfectly positioned at the northeastern tip of the maritime forest. At this location on the island, the beach is plentiful and close to the house, and the views are breathtaking. The interior design, inspired by the curves of shells found on the beach, leads the eyes through the Great Room to every custom and thoughtfully planned area in the home. A master bedroom, accessible by elevator, has a private 159 SF balcony with views over the beach and luxurious high ceilings. Two guest bedrooms on the main floor are each a marvel of design and will delight guests through their sheer inventiveness. A new large kitchen on the main floor has sweeping views of the interior architecture and the beach beyond. A skylight at the top of the dome, just above a study and a wet bar, lies on a favorite cruising pattern for pelicans whose shadows are seen passing over and through the house daily. The Eye of the Storm features 889 square feet of deck space, almost all of which is oriented toward the beach. The main deck is a lovely, large gathering place that will anchor both coffee breaks and epic parties. People want to be on this deck ALL THE TIME! If there weren't already enough to entertain, the home includes a bank vault room behind the kitchen pantry and laundry room. Stock your valuables there, or use it as a wine vault. There are two flex rooms (182 SF and 344 SF) on the ground floor of the house. Each one has electricity and a wall AC unit, and the larger room has a water hook up. In the past these rooms have been used guest rooms, work rooms, and storage rooms. Most recently, the larger room has been used as an art studio. We have included these rooms in the overall square footage of the house (not in the bedroom count), but please note that to access these rooms under the house, one must leave the main home and walk outside and under the house. Up to four or five vehicles can park under the house, but they would need to be positioned end-to-end, so it is best to make use of the large driveway area for most guest parking. And beware – they will come. Below you can download the as-built plan of the Eye of the Storm.